Special Times with Dad + Cardstore Giveaway! This giveaway is now closed. The winner was Paige, who said, “I LOVE CARDSTORE. I’d better look for cards, now, too. Pinned!” Congratulations, Paige! We have a feeling you’ll put your $100 to good use! Before I tell you about my dad, please note today is the last day to enter this giveaway – so get hopping! Father’s Day is right around the corner, so let’s talk about our dads for a moment. Since this is a food blog, wouldn’t it be perfect if I told you how the most special times spent with my dad were cooking? Yeah, that would be really cute and on theme! Alas, it’s not the case! My dad could cook spaghetti, toast with cheese and jam, and anchovy potato casserole. And I was only willing to eat one of those items. But, no matter, because I do have a special activity that I did with my dad year after year after year growing up: reading. Both of my parents are avid readers and they passed that along to me. In addition to always seeing my parents reading, my dad would read books to me all the time. 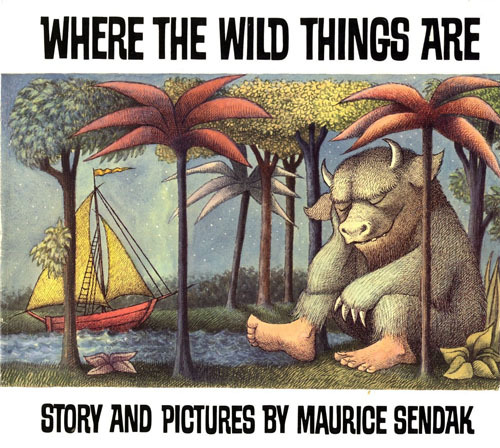 My favorite book to read with him was Where the Wild Things Are. There is not a soul alive who can do better wild rumpus sound effects than my dad. There really is something magical about reading with your kids. You get in lots of good cuddle time. You help shape your child’s brain development in a really impactful way. And you connect over stories that stay with you for life. I am so grateful that my dad was good about reading with me and I am trying to follow in his footsteps with my own children. Cardstore is sponsoring my post today and I wanted to share with you a Pinterest contest called Pin it for Papa that they have running right now, celebrating those special moments shared with Dad. And the contest involves a giveaway! Here’s how to enter! Repin as many Pin it for Papa images as you want. Each repin is an entry to win a $300 Visa gift card. Also, one winner will be chosen to win a $50 gift card to Cardstore. Not on Pinterest? What are you waiting for? It’s fun! Good luck everyone!